Once again the holiday season is upon us. That means crowded malls, visits with friends and family and yes of course, the Rapha Festive 500! The Rapha Festive 500 is a Strava challenge that helps you get off the couch and keep fit during some of the shortest and often coldest days of Winter. 12/24/13 - Rode with Suburban Cyclists from Perkasie up to Lumberville General store for about 40 road miles. Average temperature was 34 degrees, not a bad day for riding overall. Nine riders showed up for the Christmas Eve ride. It was a great idea to pick up my rider packet on Friday night rather than wait until Saturday. Instead of waiting in line in a mob scene of riders, Gail and I enjoyed a meal while we were in Lambertville. The food was excellent at Tortuga. I was immediately impressed with the custom race numbers for the event complete with rider name. 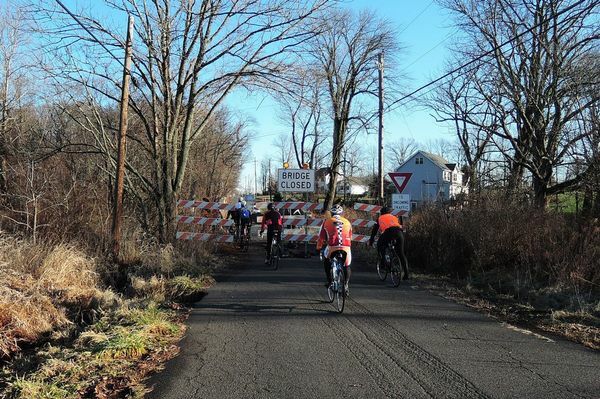 The weather was great for the 2013 L'Enfer D'Hunterdon (Hell of Hunterdon). The sun on our backs and reasonable temperatures seemed to make the miles slipped by. Not everyone emerged unscathed however. Each gravel segment was marked by riders with flats on the side of the road, either on the segment itself or afterwards when they realized they were losing air. It was impressive to see 550 riders all lined up for a mass start. Fortunately they let us go in waves of maybe 75 riders at a time. I was in the second wave. There were lots of fast riders in there, some riding in teams and occassionally solo. It was nice to be able to sit in with a like-paced group for a while especially on the faster road segments. Mike Rowe and I maintained a pace of about 17.4 up to the first aid station. There were lots of people to ride with so we had some help maintaining the pace. Often on the gravel segments and climbs the peloton would break apart and regroup in some new fashion later on. I did end up solo into the wind for a while which I'm sure decreased my average speed quite a bit. This was on the segment leading up to the second aid station. Overall the event was very professional. Sram provided support and was carrying lots of spare tubes and tires. Of course most riders carried their own stuff. Sram even has some nice S-Works bikes on the roof but not sure anyone ended up riding them. Afterwards there was plenty of beer and pasta in a room full of sweaty but friendly bikers. Another nice touch was the custom beer glass we got to take home. Our pace slacked off toward the end, Mike was pretty beat and I didn't mind taking it easy the last few miles. I missed a little bit on the computer when we started but here's the ride. This ride is definately worth a return trip. We'll be looking for it again next year and registering early. I've gone through several iterations of thinking in my planning for Hell of Hunterdon on March 30, 2013. Originally I was going to ride it like a race, using the lightest and fastest equipment I could come up with. I'm sure there will be lots of other people doing just that. I've got my carbon Opera Canova and some Torelli Bormio clinchers that are really strong. The only thing left to pick out would be tires. I didn't think I had any that were specifically geared toward gravel and were wide enough (at least 25 mm and maybe 28). I looked at getting some Vittoria Pave tires which are really made for cobblestones but I read that people were using them for racing on gravel. We did a recon ride of the course on March 3rd. It was an impromptu ride that I learned about on Facebook and I just showed up. There were maybe 6 of us. Although I didn't know what to expect I decided not to take my Opera since I had it outfitted with Boyd carbon wheels and 23mm Vredstein tires. Instead I brought my Cannondale CAAD8 and my commuting wheels (Mavic Aksium) with Continental Gatorskins 28mm (not hardshell). I was afraid that the wheels would be too heavy and it would be hard to keep up with the other folks. Luckily the pace was moderate and I had no trouble with the route at all. One rider was sporting Pave tires and was also a pretty good climber. I thought again about getting a pair just for the event. When I learned that some of my friends from SCU were also riding the HoH I decided to ride with them instead of racing. That meant that I wouldn't be pushing the pace, instead I would turn it into a fun ride and I wouldn't have to worry about going over the handlebars on fast gravel descents and breaking my bike, collarbone or worse. It looks like the weather will be pretty good this year. I'll be wearing my full International Christian Cycling Club kit since it should be warming up nicely during the day. So I came full circle on equipment. I'll be using my aluminum Cannondale CAAD8, Mavic Aksium wheels, Gatorskin 28mm tires. Another good thing about the Cannondale is that the water bottle holders are aluminum and will hold the bottles much better than the carbon fiber ones on the Opera. I'll probably stick with the same setup when I ride sweep on the Fools Classic on April 6. I spent the last few months looking for the best lights to get for my commute. It's about 17 to 19 miles each way depending on the route and now that we're back on Eastern Standard Time it's dark when I leave work. Soon it will be pretty dark when I go in too. There are lots of choices out there. My current setup is a Cateye headlight that puts out about 100 lumens and a Planet Bike Superflash rear blinky. These lights work in a pinch but the front light is too much of a spot to illuminate enough of the road, especially if you're going fast. The rear blinky is actually very noticeable and I used to think it was pretty bright. Recently I was out with the Suburban Cyclists Unlimited on a few evening rides that got pretty dark toward the end. A few folks had rather bright light setups including one fellow who had a two-watt rear light that was impressive. I decided that I just had to have something like that for myself. When you shop for lighting you will find a big deficiency in the rear lighting department. Even high-end manufacturers like Niterider are severely lacking in bright taillights. Instead they have lights that flash and blink but they are pretty low power so that they have long runtimes. I guess maybe that's important to people. Personally it's not all that important. What is important is that people see me and respect my presence on the road. I can always charge up the light at work, home or both. After plenty of Googling and reading I came upon a lesser-known manufacturer located in New Hampshire. The name is DiNotte Lighting. Being an engineering type I really liked their design philosophy which includes not pushing the edge with components and making safety a priority. They also offer reasonable pricing on extras and replacement batteries. Every review I read raved about their customer service. I have to admit that my own experience was also extraordinary. I ended up getting the 1200L headlight which has dual quad LEDs and the 400R taillight. I opted for four-cell lithium-ion battery for the taillight so that the batteries would be interchangeable. That way I could switch them if I was running short on one or the other. The ordering was straightforward on the website and I included a note asking if they could ship right away as I was in dire need of adequate lighting for my commute. I was not disappointed. The shipment went out Express Mail and although I didn't get it the next day (this is USPS after all) I received it on Saturday which meant I had plenty of time to explore my mounting options before my Monday commute. The batteries took the full charge time (4 hours). I followed the manufacturer recommendation and just left them alone until the charger turned green for both. Meanwhile I looked at the mounting hardware. The headlight is a no-brainer. It straps right on the handlebar with a rubber strap. The strap looks pretty durable and I'm hopeful that it will hold up okay. The battery isn't very long (about 3") and I was able to strap it right to my handlebar stem. The connectors are rubber and fit snugly. When you take them apart they make a popping sound from the suction being released suggesting that they will probably remain watertight in operation. The taillight took a little longer in my case. Since I have a rack on the back the ideal place to put the light is on the back of the rack. I sorted through the many fittings suppled and found one that fit pretty good on the rear bar of the rack. I wanted to use the quick release option so that took a few extra minutes to assemble. The screws for the quick release are really small so you have to be careful when you're assembling them and you'll need a pretty small Phillips screwdriver to do the job. The battery for the taillight was easily strapped to the rack but in operation I just put it inside my rack top bag. On the way into work I turned on the taillight and put it into the fast strobe pattern. The light has a constant low level (still very bright) with three bright flashes in the pattern. I couldn't help thinking how annoying it would be for a fellow cyclist to be following me at night in this mode. I could see the light plainly during the day. Luckily, the mode can be switched to constant and the light level reduced to the low setting which should be less of a problem. For traffic the flashing pattern works well. The real operational test was coming home from work today. I took an alternate route which included a piece of the Schuykill River Trail so that I could try out the lights before hitting the dark streets. For the trail I opted for the pulse (I think medium setting) on the headlight. It made me visible to oncoming riders and walkers/joggers. People walking in my direction also noticed the flash of the light from far away and stayed to the right so I could pass. When I left the path and hit the roads it wasn't completely dark yet so I left it on flash for a while. Then I changed it to steady mode (requires powering off the light momentarily with a long press then holding power button for six seconds then turning it back on). I found that medium power was plenty for seeing the road but it was nice to be able to crank it up to the high setting when there is oncoming traffic. On low-traffic roads I put it down on low and it was still adequate. The beam covered a wide section of road and projected plenty ahead of me so that I felt comfortable even on roads I didn't know that well moving at a speed of 18+ MPH. I'm sure I'll be writing more about these lights as I use them more but I really couldn't be happier with them. Yes, they are expensive. But I would rather pay for good lights than have an accident. I spent some time today trying out Evernote. It seems to do some things well but I'm still forming my overall opinion. One of the things I wanted to do was to be able to send emails from my Entourage client into Evernote. A quick Google search revealed a script from Veritrope that does just that. It took me a while to get it going though. I use Entourage 2008 on Mac Snow Leopard. I followed the instructions which were fairly straightforward but I was not able to get the script to execute, nor did it show up on the Entourage script menu. Here are the things that I found that may be helpful for someone else who is trying the same thing. Afterward, everything works from the Entourage script menu and also by using the keyboard shortcut, in this case Command-Shift-E. It would be really nice if this script could also send attachments but alas it only does text (and not even pictures). So I guess I still have to do things a roundabout way to get the entire message in there such as forward it. Except for the attachments I suppose I could print it to a PDF. Evernote sets up a PDF-to-Evernote option for printed output.